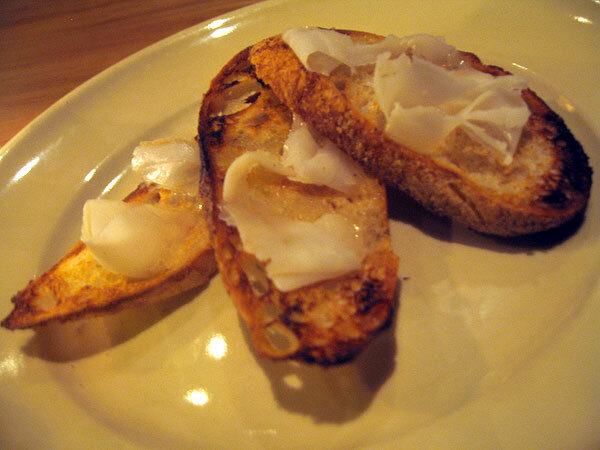 Home // Restaurant Reviews // San Francisco Restaurant Reviews // I Challenged Cotogna. Cotogna Won. And let me tell you...it did. As much as I wanted to be underwhelmed, everything about my two dining experiences, from the food to the service to the atmosphere, amazed me. My first impression was one of surprise; walking in, I was instantly caught off-guard by the crowd. I wasn’t intending on seeing suits and ties in a casual, rustic, Italian restaurant. Despite its informal interior, its downtown location, right next to its high-end big brother, Quince, makes the look of the crowd far more upscale than any other restaurant in Cotogna’s niche. A jacket may be unnecessary, but you won’t look out of place if you decide to throw on that designer cashmere coat. And although the menu may seem rustic and relaxed, the plates that come out of the kitchen are as sophisticated as that dapper coat you’re sporting. I was hooked as soon as I took my first bite of the starters: a Salad of Chicories with pomegranate, olio nuovo & burrata ($10), and a serving of Grilled Monterey Bay Squid with grapefruit & puntarella ($10). The salad, while uncomplicated, was perfectly balanced, refreshing, and not overly dressed; much can be said about a restaurant that serves impeccable salads. The calamari was perfectly executed – not rubbery at all and incredibly juicy. It was the simplicity of this dish that allowed the pure, delectable flavor of the squid to really shine. Next came the pastas, the course for which Chef Tusk is most renowned. 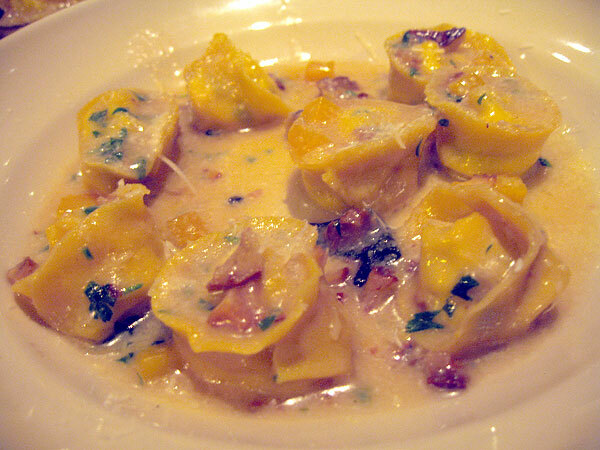 While every pasta (such as the Chestnut Tortelloni with pumpkin & radicchio) lived up to his sterling reputation, the most notable on the menu is the Farm Egg Raviolo with brown butter ($16) – also the most decadent dish of the meal. A beautiful, delicate farm egg is cooked in 180 degree water for 2-3 minutes, until the yolk is runny enough to spill slightly when cut, but firm enough to not run out over the entire plate. 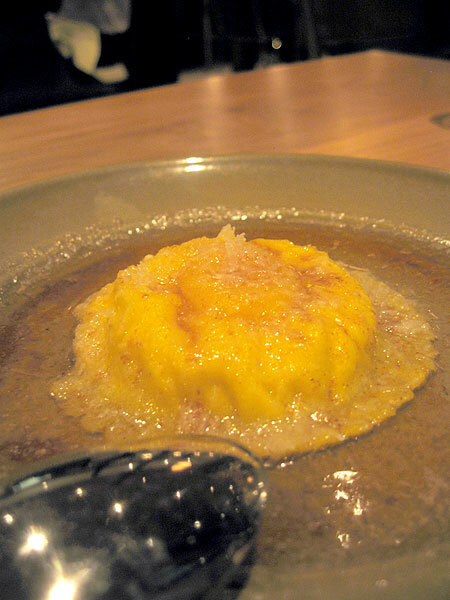 Of all of the dishes, it was this raviolo that best demonstrated the prowess of the kitchen – done in the absence of circulators or timers, this dish showed that the kitchen really knows how to cook. 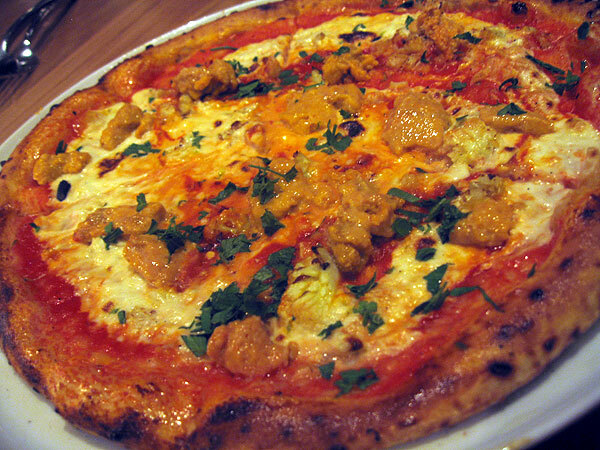 The Pizza with Sea Urchin, cauliflower & Sicilian chili ($15) was the only mediocre dish on the menu. While there was nothing blatantly wrong with its preparation, it didn’t make as strong of an impression as other selections, and wasn’t a necessary addition to the meal. 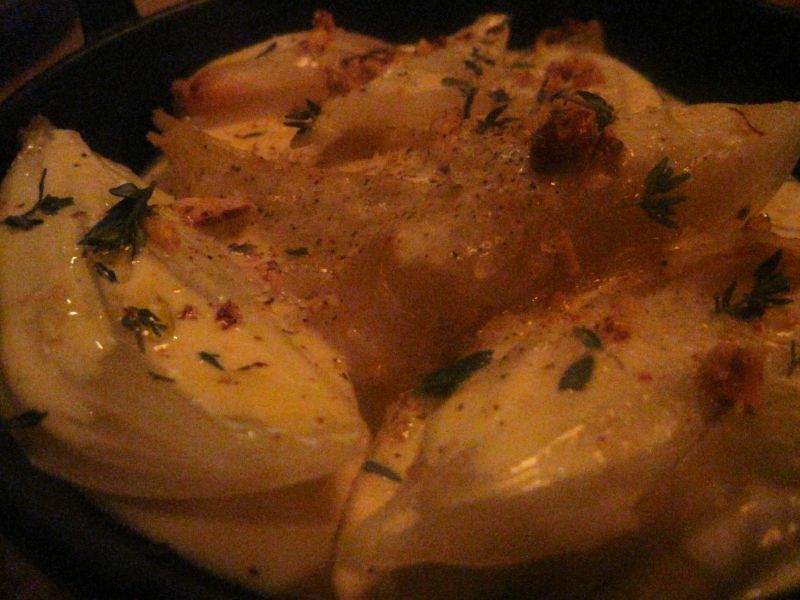 However, a side order of Ember Roasted Onions with fonduta & hazelnut ($6) left my mouth with a lasting impression. Smothered in cream and layered with different textures, a simple onion became supple, rich, smoky, and outstanding. 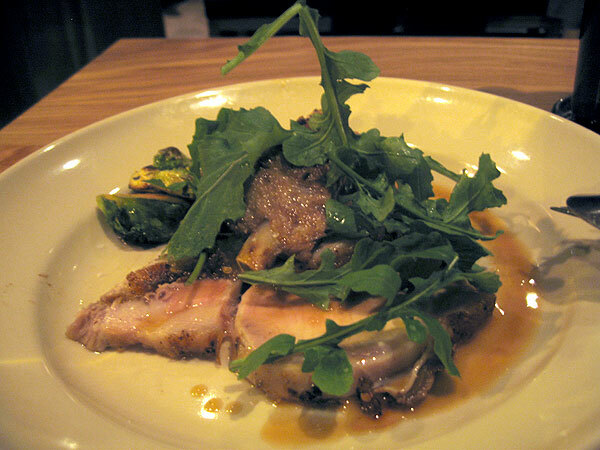 Spit Roasted Pork with wild fennel & hot pepper ($24) came as an entrée, and absolutely blew me away. I usually don’t adore simple, roasted meats, but this pork loin was so moist and so well-seasoned (actually over-seasoned on the outside to carry the flavor to the center), that for me it is one of the most stand-out dishes on the menu. Finally, but importantly, the desserts. 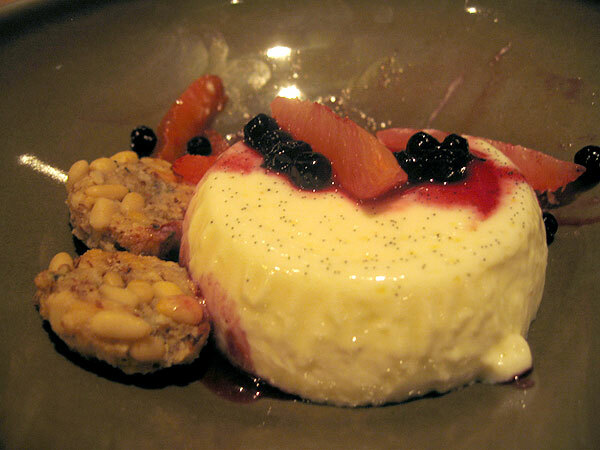 While I’ve only been lucky enough to try the Crème Fraiche Panna Cotta with pinenut cookies ($7), it’s clear that this is not a place where you should skip dessert. The flavor of the crème fraiche made the dish refreshing while, at the same time, rich and beautifully creamy in consistency. And the pine nut cookies, Cotogna’s twist on the classic Pignoli, were amazing. So good in fact, that I stuffed a few into my purse for the drive home. The service, while busy, has always been attentive and friendly. Let’s face it, this restaurant is slammed every night and the servers can’t be your best friend. But, although there may be a hungry mob gathering out front, they never make you feel rushed. And on that note, don’t expect to walk in and be seated within 15 minutes; the wait at Cotogna, even on a weeknight, looks more like 60-90 minutes. It doesn’t matter who you are, if you don’t have a reservation you’re going to wait. 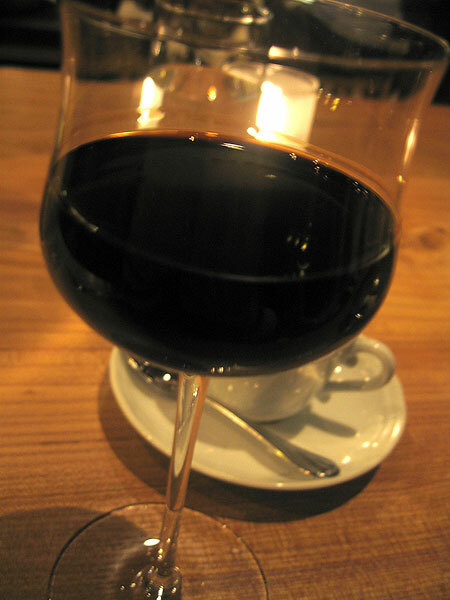 Luckily, there’s a wonderful bar right next door in Quince to make that wait a little less painful. And there’s just one final note that I think is important to bring up. While the entire kitchen team is obviously incredibly talented, I was shocked to see Chef Tusk not only in the kitchen, but on the line. There he was, sweating and in the weeds, right next to his employees. I’m used to seeing the Owner/Executive Chef at the pass, expediting orders and overseeing all of the action, and only on a few occasions have I ever seen one actually slaving away over the stoves. I was impressed to say the least, and seeing that made it clear to me that Chef Tusk was not only immersed in the opening of Cotogna, but is still intimately involved in every aspect of this restaurant. Despite my initial reservations, it’s clear that this restaurant deserves all of the hype and accolades it has received. With this level of execution and such a warm, inviting atmosphere, there’s no doubt that Cotogna should be ranked amongst the best Italian restaurants, or simply the best restaurants, in San Francisco. I must tell you I never saw anything like this before. 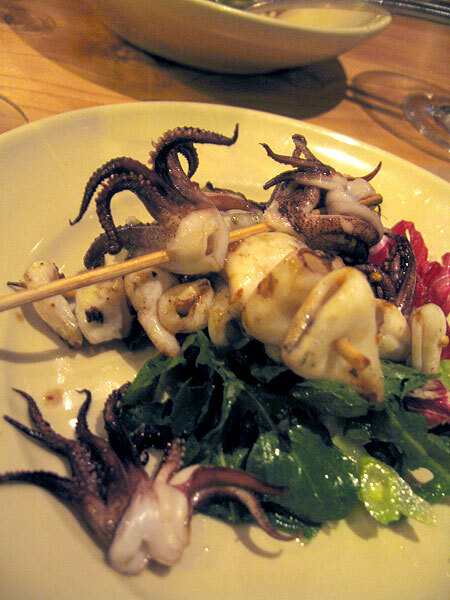 I mean all the dishes were extremely mouth-watering, especially the grilled squid, the pizza and the panna cotta. God, who am I kidding? Everything looked delicious and awesome. Thanks for sharing. 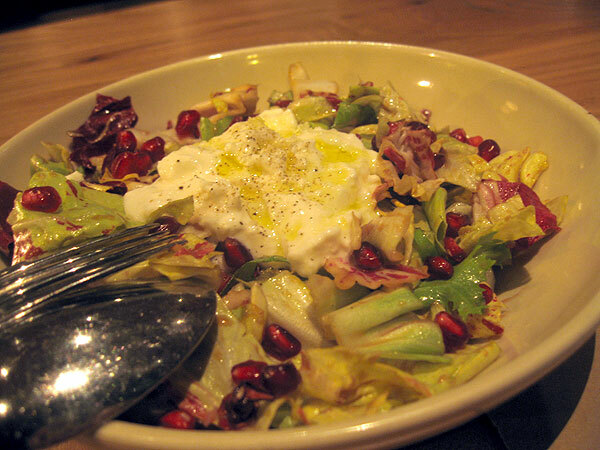 I ate that Buratta salad too and LOVED it! I have been dreaming about it and want to go back just to have it again and figure out how to make it myself. Make sure to check the menu before you go because the last time I was there 1/2 of it was different!